The Donner Lake Rim Trail (DLRT) is a project of the Truckee Donner Land Trust to build a multi-use dirt trail encircling the peaks around Donner Lake. 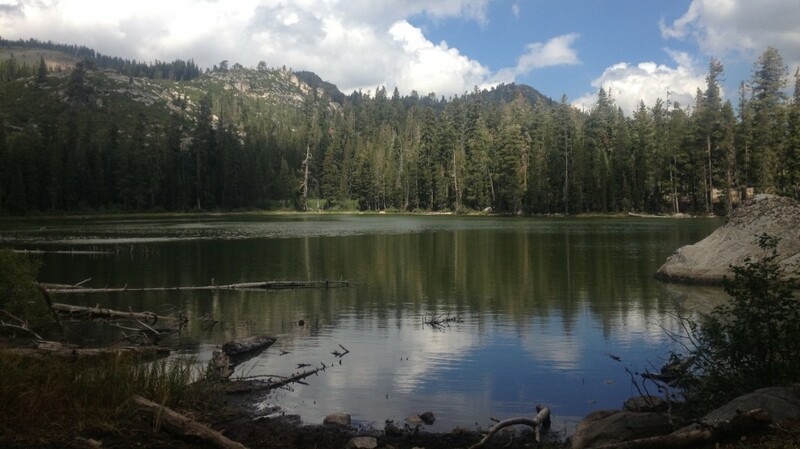 This 12.35-mile lollypop route takes you past Summit Lake to the Pacific Crest Trail (PCT) and back to the DLRT via the Summit Lake trail. From downtown Truckee, go 5.5 miles west on Interstate 80 to Donner Lake exit 180. Go down the ramp (but not under the freeway) and take the only right turn to the trailhead. There is dirt parking as well as paved options along the road; no restrooms. Click here for an interactive map and GPS data for the DLRT / Summit Lake / PCT Lollypop route. Click here for a Donner Lake Rim Trail (DLRT) map. General Directions: Take the DLRT west about 6 miles from the trailhead to where the PCT crosses the dirt road at an unmarked intersection. Turn left on the PCT and follow it to the Summit Lake Trail. Take the Summit Lake Trail back to the DLRT; turn right and go back the way you came. 5.9 miles: The PCT sneaks across the dirt road completely unmarked. Take a left on the PCT to head east. 6.25 miles: Keep left to stay on the PCT. (The right spur goes to Castlr Peak trailhead. 7 miles: West Lake and Interstate 80 are visible (and audible) to the right. Shortly thereafter, the trail passes directly behind the I-80 Donner Summit Rest Area (water and restrooms). 8.1 miles: Return to the big single track intersection and take the DLRT to the right toward Summit Lake. 11.25 miles: Turn right onto the Wendin Way Access trail to return to the trailhead. Turn around at Summit Lake for a 7.5-mile out-and-back. Another great run! I did this as an out-n-back to the PCT (I forgot to bring the directions along). I had only planned on running about 8 miles, but it just kept getting more and more beautiful so I kept going! Thanks for another great route! I’m planning on doing the 7.5 version on September 26, 2015 after attending a wedding on Donner Pass that morning. From Southern California so I will have the directions with me!! Glad someone did it recently and did a report. Glad you enjoyed! I’m headed up there tomorrow with a friend. Thanks for the great link, map and directions. We are in town from Phoenix and ran the trail this morning. Spectacular run! Enjoyed it immensely.